Nyonya Snack Roti Ayam is very simple to make, even children can learn how to make them easily. 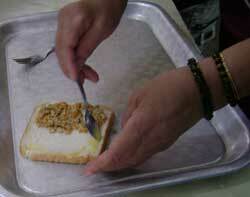 It is similar to French toast but with a twist, there is a filling made of minced chicken. 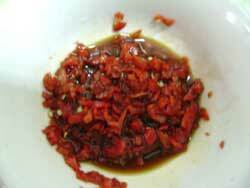 You also eat it with a sauce made of finely chopped chilies with Worcestershire Sauce. Actually in Nyonya cuisine, the sauce is used liberally in many dishes. It is a legacy of Hainanese cooks who were employed by the rich Chinese tycoons or the British employers who lived in Penang at that time. The sauce was brought in from England and until now a staple ingredient in Nyonya food. Again I was lucky to learn how to make it by watching Nyonya Belinda Neoh. She came to teach a group of children from Anak-Anak Kota. They were all secondary students. The boys and girls in this group were learning how to be street journalists at a young age. They got to learn graphic design skills, interviewing skills, as well as other arts. On that day they learned how to cook. It was interesting to watch how they cope with the task. In my observation, it looked like the boys had a head start. I was pleasantly surprised to see that some of them were able to chop garlic like a professional chef, as well as being able to crack eggs using only one hand (even I cannot do that!). On the contrary some girls even did not know how to handle a knife properly. So, girls, you really must catch up! 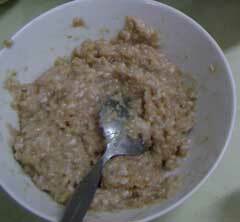 This simple dish, even though used cheap basic ingredients, take a lot of time to prepare. The children were given their own knives and chopping boards. They helped with chopping the garlic and also dicing the carrot, mushrooms and onion. 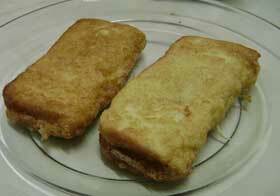 Later, everyone fried their own nyonya snack - the French toast. Needless to say, the food was all gone in record time. 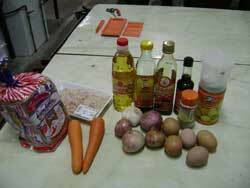 So here are the ingredients and the methods of how to make roti ayam, a simple Nyonya snack. Put in the mushrooms, followed by the carrot and onion. 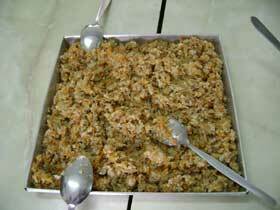 Put in the minced meat and mix well with the vegetables. Pour in the corn starch mixture to thicken the mix. It is very important to for the filling to be dry. Otherwise, when you fill it in the sandwich, the sandwich will be soggy and you will not be able to make a beautiful French toast with it. Get a slice of bread and fill it half with the filling.